For visitors and residents of Cleveland this summer, the sight of a nine-foot tall, wildly painted and decorated Fender Strat will become commonplace. In a project called GuitarMania, artists team up with local and national sponsors to fill the city streets with these larger-than-life icons of music. The guitars’ themes address specific issues, as in the case of Lisa Elias’ sparkly Passionately Pink for the Cure, and celebrate Cleveland institutions, like Jim Hurguy’s All for One Cleveland Cavaliers guitar. While some of the guitars are simply repainted, some artists choose to transform the entire guitar like Susie Frazier Mueller’s Crocodile Rock, which takes the shape and texture of a crocodile. The group of more than 75 guitars started their journey at the Rock and Roll Hall of Fame on May 25th before being moved to their individual locations throughout the city. GuitarMania has a map to guide viewers to specific guitars available on their website. After Labor Day, the guitars will return to the Rock and Roll Hall of Fame for six weeks until an auction on October 20. The guitars represent a celebration of the city’s art and musical culture, while raising money for the United Way of Greater Cleveland and the Rock and Roll Hall of Fame and Museum’s education fund. The United Way is an independent nonprofit organization that raises money to help support health and human service causes. The Rock and Roll Hall of Fame and Museum’s education fund promotes a variety of music-education ventures for all ages in the community. Funds are raised through the sponsors of the guitars, which range from local banks to sports teams and individuals. After the display is over, an auction will be held at the Rock and Roll Hall of Fame. The $75 per ticket gala event draws a variety of bidders – including some well-known rockers. GuitarMania also produces miniature models of select guitars from past years which are available at various stores throughout Ohio and through Fender USA’s online store. The miniatures retail for $24.99. 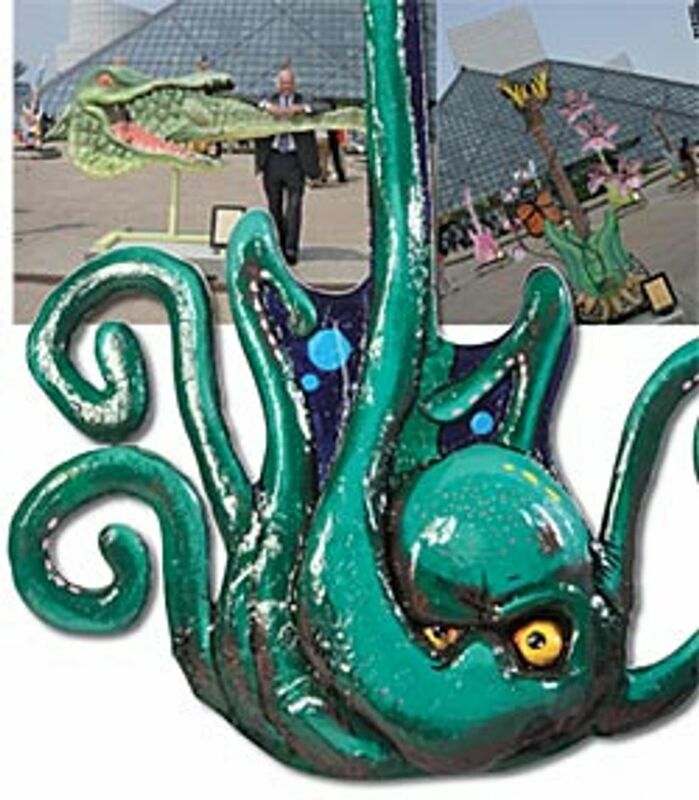 This is the third time that Cleveland has hosted the project – giant guitars first took over the city in 2002, and did so again in 2004. The first two incarnations of the project raised more than $1.5 million for the charities. This year’s GuitarMania brings the art and music into local high schools with a new project called It’s All Guitars! where high school students are given 30 real Fender Strats to decorate. These guitars will be on display at public library branches around the city during the summer and will also be auctioned off at the October 20 auction. It’s All Guitars! also served as a competition where one of the student-designed guitars was replicated in nine-foot glory for participation in GuitarMania. The winning guitar by Regina High School art students was called “Sweet Cleveland,” and featured a candy theme.